I have been using Spelling City for YEARS! It is a fun and engaging way for students to practice their spelling words. Plus, there are tons of choices as far as games and practice activities for students. It can be amazing but overwhelming. 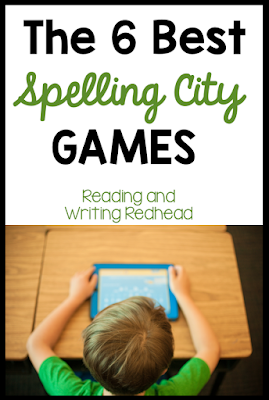 Additionally, I noticed that when students worked on Spelling City at home and in class, they were not always mastering their words. Spelling City is terrific because teachers, parents, and students can all check student records and see data like which activities students chose, how long they spent on it, and their score if applicable. After studying my student data, I realized kiddos may have been choosing to play games and do activities that were NOT helping them learn the words. I put together a list of the 6 best Spelling City games for some parents, but I realized that every teacher and parent might benefit from this info! So when I looked very closely at Spelling City's activities, some of them were fun and popular with the students, but didn't actually involve spelling practice - which is the point! For example - Silly Bulls and Rhyme Time fit this category. I took a look at every activity and... I present you with my 6 favorite Spelling City games! If there are any I missed or you think would be beneficial, comment below and let me know! Before I get started though - in case you aren't familiar, here is one way to get to the games. When on tablets and iPads, choose your word list and click the games button. One of the best games! It incorporates spelling practice with a fun little game. The cat has to aim and hit each letter in the correct order to spell the word correctly. What I love about Spelling City is that the word is spoken, and a sentence is provided for students to hear the word in context! A basic but very useful practice activity is the practice test. It's under Test Me and students would need to hit "Practice Test" and not "Test" since Spelling City only allows students to take the actual test once. Teachers can reset the student's account manually but it is a bit of a hassle. For the practice test, the word and a sentence are dictated and students type the word in the box and click next to move on. Students can also click "word" and "sentence" again as needed to make sure they heard the word correctly. Additionally, something that was added recently was the ability for students to check their work at the end. They can reread what they typed and go back and edit if they want before doing a final submit. Two useful games/activities are Initial Sound Speller and Final Sound Speller. They work very similarly, With Initial Sound Speller, students must choose the initial sound and with Final Sound Speller, as you see below, students choose the final sound. When students tap the letter(s), Spelling City tells them what sound it makes so students can determine if it makes sense. If they choose wrong, Spelling City basically says "oops, try again". When they choose the correct letter, the word is sounded out for them so they can make those sound/spelling connections. Test n Teach is simple but it is useful. It may only work on web browsers though - I tested it now on my phone and it was not working. Similar to a practice test, a word and a sentence are dictated and then students type the spelling. They can have the word and/or sentence repeated. The words are sorted into correct and incorrect so students can focus on certain words to practice more. Speedy Speller is one of my favorites! It encourages speed with the "TNT", however, might not be the best for students who do not like to feel rushed or be timed. A word and sentence is dictated and students type it in. The top picture is what it looks like before students start and the bottom picture shows that the TNT "string" (I don't know what its called!) lit up and it starts to shorten. So what is your favorite Spelling City activity? Comment below and let us know! Hope these games and activities will help your students master their words!